Tile and grout attracts stains and dirt and they require attentive cleaning, as well. "A1 Carpet Clean" tile and grout cleaning service is ready for your concerns and the correct tools to effectively clean your tile and grout. Our tile and grout cleaning service professionals working for you will have your floors clean and fresh when you call us today! We're prepared anytime you are in need of tile and grout service cures anywhere in the Los Angeles and Orange County area to provide you fresh and clean flooring. "A1 Carpet Clean"'s skilled service representatives are well informed on all types of grouting used, as well as bonder and additives, and for top of the line tile and grout cleaning service you can be sure we will exceed your expectations! Experts at "A1 Carpet Clean" make it our promise that our professional tile and grout cleaning service will have your floors so clean that it will be thought of as new. For stain resistant floors that are cleaned perfectly. Experts at "A1 Carpet Clean" provides Truck Mounted Steam Cleaning to restore your tile and grout to its original color. Our hot water pressure cleaning system cuts through years of built-up dirt, grime, germs, and grease. 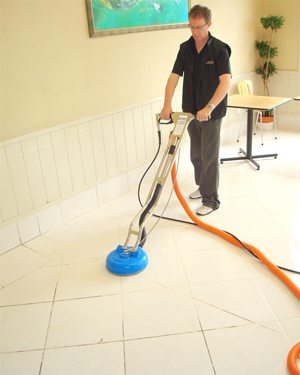 We use minimum residue cleaning solutions formulated for maximum results. Restore color and beauty to your flooring and contact our expert tile and grout cleaning service today. If you are not satisfied, then Experts at "A1 Carpet Clean" are not satisfied. That’s why, in order to make sure you will get exactly what you need, we offer you a free grout and tile cleaning estimate appointment on site, to determine what would be the best course of action in your case.